Largely unheard for more than 70 years, the recordings on Bomber Command at War stand as a tribute to the crews of Blenheims, Wellingtons, Hampdens, Stirlings, Halifaxes, Lancasters and Mosquitos operated by Bomber Command during the Second World War. 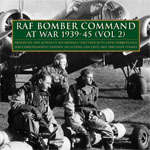 RAF Bomber Command at War (Volume 2) is available on CD and digital download. Running for 73 minutes, the broadcast and actuality recordings featured include raids on Augsburg, Kiel, Dortmund, the Rhine Dams, Amiens gaol and Aarhus, as well as low level precison strikes and the first unaided destruction of a U-boat. The album also offers first-hand accounts of early raids (1940-42) in Hampdens, Blenheims and Wellingtons, as well as later four-engined heavies. The booklet features detailed historical notes by James Hayward and images. All audio content has been carefully digitally restored. The CD is an absolute must for all historians and researchers, as well as collectors of archive broadcast recordings. CD tracklist: Blenheim destroys U-boat (1940); Raid on Danzig (1940); Raid on Munich (1940); Wellington bombs Kiel (1941); Roving patrol by Hampdens (1942); Augsburg - Lancaster VC (1942); Nightingales & Bombers (1943); 617 Squadron - Dambusters (1943); Stirling loses turret & ditches (1943); Dortmund raid - Stirling base (1943); Mosquito raid - Amiens (1944); Normandy ground support (1944); Mosquito base + Osnabruck raid (1944); Work of Rear Gunner (1944); Air Gunner debrief (1944); Mosquito raid - Aarhus (1944); Damaged Beaufighter (1944); An Airman's Letter to his Mother (1940). While Volume 1 in this series (CD41-013) mainly offers actuality recordings made by intercom during raids by heavy bombers over Germany in 1943/45, the scope of Volume 2 has been extended to include accounts of early raids during 1940/42, operations conducted under the aegis of Coastal Command, and low-level precision strikes by Mosquito aircraft. Further contemporary first-person accounts by Bomber Command personnel can also be heard on CD41-022, For Valour: The Victoria Cross. Squadron Leader M.V. Delap of 82 Squadron describes a successful attack on submarine U31 on 11 March 1940. Recorded 12 March 1940. U31 was a type VII boat commissioned in 1936. While undergoing trials in the Heligoland Bight it was sighted by Delap, who carried out a diving attack and scored two hits on the boat's hull with impact-fused bombs. His Blenheim was below safety level and sustained splinter damage. U31 sank in 50 feet of water, killing all 58 men on board, the first such success by an unaided RAF aircraft. The submarine was subsequently salved and re-commissioned in July, but sunk for a second and final time by HMS Antelope on 2 November 1940. On 17 May 1940 82 Squadron was effectively wiped out during a daylight mission over Gembloux, France. Account by an unnamed Hampden navigator of a 2000 mile round trip to Danzig (Poland) on the night of 10/11 November 1940. During this trip the cockpit of the bomber filled with two inches of snow. Recorded 16 November 1940. The raiders intended to bomb railway yards and drop propaganda leaflets, although only two of the ten attacking Hampdens are thought to have found their target. Throughout 1940 and 1941 RAF bomber operations, although often ineffectual, were the only means by which Britain could carry the war to Germany. Flight Lieutenant Coleman describes a raid on Munich in southern Germany on the night of 8 November 1940. Recorded 15 November 1940. Some 30 RAF bombers (Wellingtons and Hampdens) reached Munich, their attack on railway yards timed to coincide with Adolf Hitler's annual observance of the 1923 coup attempt in the city. The raid delayed his speech, after which Hitler vowed that "an attack on the capital of the Nazi movement will not go unpunished." It has been claimed that the devastating Luftwaffe raid on Coventry on 14 November 1940 was carried out in direct retaliation. More generally, the last three months of 1940 saw an increased emphasis on hitting targets in Germany itself, although Bomber Command's capability was still very limited. An account by Flight Lieutenant P.J.R. Kitchin, a Wellington pilot with 75 Squadron, during a night raid on the German port of Kiel in April 1941. Despite encountering engine trouble (oil pressure) en route, Kitchin pressed on to the target. There the bomber encountered searchlights and flak, and rapidly lost height, but still bombed successfully, afterwards returning to base at RAF Feltwell. Recorded 21 April 1941 (not 1944 as some sources state). Because of its status as a naval port and as production site for submarines, Kiel was heavily bombed by the Allies. Squadron Leader Kitchin DFC and the crew of Wellington X3588 failed to return from a raid on Kiel on the night of 12/13 March 1942 (one of three 75 Squadron Wellingtons lost on this raid), and are commemorated on the Runnymeade Memorial. An upbeat account by Flying Officer Jenks of a roving daylight patrol by a dozen Hampdens over north-west Germany, very probably on 2 or 4 January 1942. Recorded 12 January 1942. The distinctive, twin-engined Handley Page Hampden medium bomber (nicknamed the 'Flying Suitcase') entered service in 1938 but soon proved a regular death-trap for Bomber Command crews dispatched on daylight operations during 1940/41. However the type proved capable as a mine-layer and also operated by night, before being retired from Bomber Command in late 1942. An account by Squadron Leader John Nettleton, a Lancaster pilot with 44 Squadron, who was awarded the Victoria Cross for his part in the experimental, low-level attack on Augsburg (in southern Germany) on 17 April 1942. The MAN diesel works in Augsburg produced engines for U-boats, and the raid was requested by the Admiralty. Nettleton lead a force of 12 Lancaster bombers from 97 and 44 Squadrons in daylight over 500 miles, then pressed home the attack from beneath 50 feet. Flak and fighters took a heavy toll, however, and only half the force returned. The Avro Lancaster entered service early in 1942, and the daring Augsburg raid represented a relatively early operation for the legendary bomber type. Recorded 19 April 1942. John Dering Nettleton (born 1917) was a Rhodesian pilot, killed on 13 July 1943 when his aircraft was shot down over the Bay of Biscay while returning from a raid on Turin (Italy). Recorded on the night of 19 May 1942, when BBC engineers visited a wood in Surrey to record nightingales singing. The microphones also picked up the approach of the Bomber Command force heading for Mannheim, a raid by 197 aircraft including Wellingtons, Stirlings, Halifaxes, Hampdens, Lancasters and Manchesters, of which 11 failed to return. At first considered a possible security risk, the evocative recording was subsequently released commercially by HMV, the complete version being featured here. The raid itself inflicted relatively minor damage on Mannheim. Flight Sergeant Eric Whitney of 149 Squadron recalls a ill-fated mission to Essen on the night of 5/6 June 1942, during which his Short Stirling bomber was hit by another aircraft (variously identified as a Wellington or Me 110) and the rear gun turret severed from the fuselage. The stricken bomber was then attacked by enemy fighters and forced to ditch in the North Sea off Belgium. After 15 hours in a dinghy the crew were rescued by an ASR launch from Ramsgate. Recorded 18 June 1942. The first of the four-engined 'heavies' to enter operational service (in January 1941), the Stirling was hampered by a low service ceiling, and by the end of 1943 was withdrawn in favour of the superior Halifax and Lancaster types. Whitney's unlucky rear gunner, Sergeant K. Roderick, is buried at Cement House Cemetery, Langemark, Belgium. Three members of the crew of Lancaster AJ-P 'Popsie' of 617 Squadron interviewed by Roy Lee on 31 May 1944. All are Royal Australian Air Force (RAAF) personnel. Pilot Squadron Leader Harold Martin (DSO and Bar, DFC and Bar) pays tribute to his previous front gunner, Flight Sergeant Harry Smith, now missing in action; rear gunner Flying Officer Thomas Simpson (DFC, DFM) describes the attack on the Mohne dam on the night of 16/17 May 1943; front gunner Flying Officer Bertie Foxlee (DFC, DFM) also describes the breaching of the Mohne dam, and a subsequent mission to the south of France. AJ-P Popsie was the third aircraft to attack the Mohne dam, bombing from just 60 feet, although its Upkeep bomb overshot the target. 617 Squadron was formed for the daring low-level raid on the Ruhr dams (Operation Chastise), and lead by Wing Commander Guy Gibson VC. Although the military value of the attack remains the subject of debate, and 8 out of 18 aircraft lost (54 aircrew killed), the Dambusters raid boosted morale, and stands as a unique feat of arms. Recordings made before and after a devastating raid on Dortmund on the night of 23/24 May 1943 by Stirlings, operating from RAF Stradishall (Suffolk). The crew and squadron are unidentified, and the disparate crew interviewed may well have been assembled for this one raid. As well as commentary by Raymond Glendenning and Don Hollandbeck, the recording also features interviews with ground crew and the station commander, Air Commodore James Silvester. The Dortmund raid on the night of 23/24 May 1943 involved 826 aircraft (including 120 Stirlings), a new record for a 'non-1000' mission, and was the largest single raid made during the hard-fought Battle of the Ruhr. 599 were killed on the ground, and 1275 injured. Accounts by three Mosquito pilots who took part in Operation Jericho, the celebrated low-level precision strike on the prison at Amiens (France) on 18 February 1944. The raid involved 18 Mosquito VIs of 487 and 21 Squadrons, as well as escorting Typhoons and one further (unarmed) PRU Mosquito. The object of this special operation was to bomb the guardhouses and breach the walls of the prison, in order to free some 380 French political and Resistance prisoners, some of whom faced execution. The mission was not wholly successful in that more than 100 prisoners were killed by a single stray bomb, and most of the 258 who did manage to escape were common criminals. Two Typhoons and 3 Mosquitos were lost, including that flown by the raid leader, Group Captain Charles Pickard DSO and Bar, DFC. This recording was made on 27 May 1944 and features Wing Commander Irving Stanley Smith (DFC and Bar), Wing Commander Robert Wilson Iredale (DFC) and Flight Lieutenant Anthony Wickham (DFC). The fast and versatile De Havilland Mosquito (or 'Wooden Wonder') entered service in November 1941, and proved one of the outstanding aircraft of the war. A detailed and fascinating account by Pilot Officer Beale describing his work as a rear gunner (or 'tail-end Charlie') on Lancaster bombers, recorded 28 February 1944. Prior to enlisting in the RAF Beale was a dance band musician. Here Sergeant Eric Albon, an air gunner, talks with his station commander, probably at RAF Breighton (Yorkshire). Albon describes how he shot down a Bf 109 during a raid on Frankfurt on the night of 22/23 March 1944. On this night 816 RAF aircraft delivered a severe blow to the German city, although 33 bombers were lost. Recorded 23 March 1944. Eric Albon was later commissioned, but was killed on the night of 12/13 June 1944 when his Halifax LB820 of 78 Squadron was shot down over France. A cigarette case recovered from the wreck is held by the RAF Museum, Hendon. Actuality recordings made on the night of 12/13 April 1944, with commentary by Stewart MacPherson. On this night 39 Mosquitos undertook harassing raids on Osnabr¸ck without loss. Included here are recordings of aircraft departing and returning, as well as radio communication between WAAFs in the control tower and aircraft coming in to land. The industrial town of Osnabr¸ck in north-western Germany was a regular target for both the RAF and USAAF. Nuisance raids of this kind also served to distract and tax German defences. Another live report from Stewart MacPherson as more than 1000 aircraft of Bomber Command pound German positions south and south-east of Caen in preparation for Operation Totalize, the advance towards Falaise by the 2nd Canadian and 51st Highland Divisions. Recorded from 23.07 hours onwards on 7 August 1944. On the night of 7/8 August, 1019 aircraft - 614 Lancasters, 392 Halifaxes, 13 Mosquitos - attacked five aiming points in front of Allied positions. The attacks were carefully controlled, and only 660 aircraft actually bombed. Ten Lancasters were lost. This recording features actuality of bombs and shells exploding, and gives some idea of the ferocity of aerial bombardment; the Midget disk recorder is shaken by one particularly violent detonation. An account by Squadron Leader D.C. Pritchard of 143 Squadron, whose Beaufighter was damaged by flak during an anti-shipping strike off Den Helder, but managed to return to base at North Coates, Lincolnshire. Recorded 26 September 1944. Introduced into service in July 1940, the Bristol Beaufighter (or 'Beau') was largely outclassed by the Mosquito, but proved effective as a night fighter and torpedo bomber, and was also operated by the USAAF. Along with the raid on Amiens jail (see above), the attack on the Gestapo HQ at Aarhus (Denmark) ranks as one of the most daring examples of rapid response, low-level RAF strikes in support of Resistance movements in occupied Europe. On 31 October 1944, 24 Mosquito VIs of 464, 487 and 21 Squadrons set out from Swanton Morley (Norfolk), escorted by P-51 Mustangs of 316 Squadron. The raid commenced at 11.40 am and resulted in the near-complete destruction of the Gestapo and SD facility, housed in university buildings, erasing many records as well as senior Nazi personnel. A number of prisoners were also able to escape. Two Mosquitos of 487 Squadron were damaged by bomb blast, one landing in Sweden. This recording was made on 1 November 1944 and features the crew of aircraft NS994 of 464 (RAAF) Squadron, Flying Officer D.S. Bedford and Wing Commander A.W. Langton. A detailed account of the raid is featured in After the Battle magazine, issue 54. Reading by Sir John Gielgud of a letter attributed to Flying Officer Vivian Rosewarne, a Wellington pilot with 38 Squadron operating from RAF Marham in Norfolk. Born in 1916, Rosewarne was reported missing, believed killed, on 31 May 1940, and is buried at Veurne Cemetery in Belgium. His deeply moving letter was reproduced in the Times on 18 June, and within days the paper had received 10,000 requests for a re-prints of the text. By the end of the year half a million copies had been sold in pamphlet form, and in 1941 Rosewarne's letter formed the basis of a short film by director Michael Powell, from which this recording is taken. "Simple and direct, but at the same time splendid and uplifting." Approximately 125,000 aircrew served in Bomber Command between 1939 and 1945, of whom more some 55,500 were killed and 8404 wounded. Bomber Command carried out a total of 387,416 sorties on which 8953 aircraft were lost. The approximate tonnage of bombs dropped was 955,044 tons. This CD is dedicated to the memory of the men of Bomber Command killed during the Second World War. Also available: Bomber Command Volume 1.